Can restoration funding save Alabama’s ailing oyster industry? Despite Alabama’s ongoing efforts to revamp oyster production, divers saw “next to nothing” on Mobile Bay’s public reefs this year, but with millions of restoration dollars at their disposal, state officials believe they’re looking at a once-in-a-lifetime chance to save the once thriving industry. For the Alabama Department of Conservation and Natural Resources (ADCNR), oyster productivity is measured in pounds of meat, and oyster landings from the past 37 years show local waters used to routinely produce more than a million pounds of oysters annually. 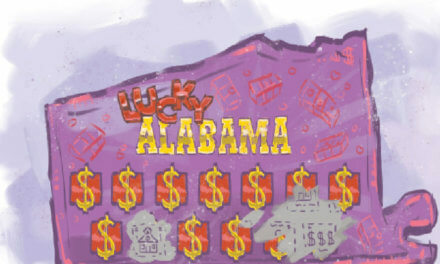 While the state might measure the success and failure of its rehabilitation efforts in pounds, the oystermen, seafood distributors and restaurateurs that make up a sizable chunk of Alabama’s coastal economy feel the effects in dollars and cents. Not that long ago, Wintzell’s Oyster House in downtown Mobile was able to entice customers through the door with “25 cent oysters” — a happy hour special that would be impossible to sustain at current market prices. On the menu today, a half-dozen is priced at just under $10. As many close to the industry can attest, there’s no shortage of finger-pointing when it comes to identifying reasons oyster reefs that once produced abundantly no longer do, but in most Gulf states, marine biologists are still looking for answers. 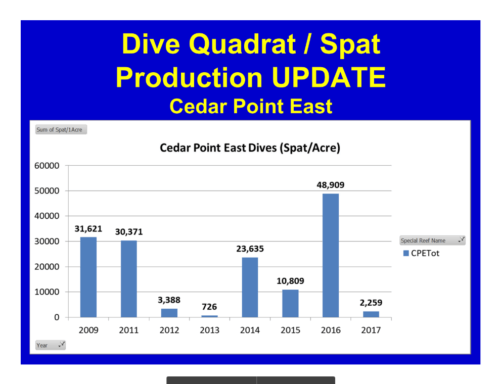 If there is a singular cause for the sustained low levels of oyster production in Alabama, Herrmann says he hasn’t found it. 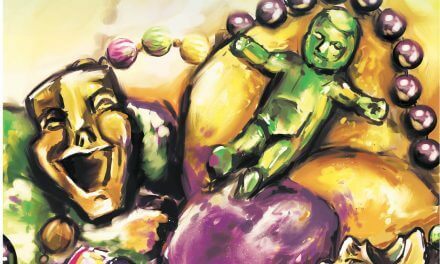 What he has seen, though, is a string of outside events that have no doubt affected the survival rate of oysters in Mobile Bay. In 2004 there was Hurricane Ivan, which made landfall once near Baldwin County and again as a tropical depression in Louisiana. In 2005, Hurricane Katrina impacted oyster harvests across the Gulf Coast, though Alabama actually recorded an increase that year. The biggest impact in Alabama in recent history was in 2008, when oyster production fell nearly 90 percent after salinity — the level of salt in the water — increased and created an ideal environment for the predacious oyster drill (an invasive species of snail). In 2010, it was the Deepwater Horizon oil spill. One of the biggest challenges in recent years has been the fluctuation of coastal salinity. When there’s too little rain, high salinity can attract predators and cause diseases in the oyster population, but if there’s too much rain, the salinity can drop and oysters can die. This year, Herrmann said, there was a 19-day period between June and July when salinity at the public reefs dropped below 5 parts per thousand. That means there were only 5 liters of salt for every 1,000 liters of water — conditions an oyster could only survive for a few days at most. 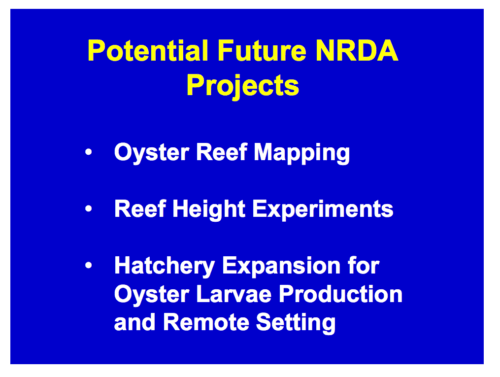 Herrmann said there are a number of natural events that can affect oyster production, and for centuries they have. 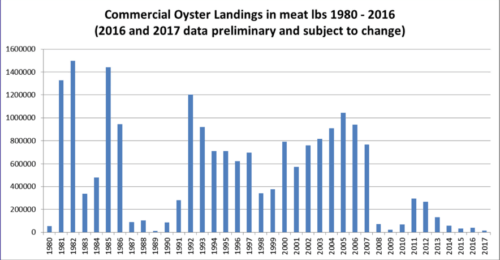 Unlike in the past, though, Alabama oysters do not appear to be rebounding, at least not as quickly as they have after similar historic events. When it comes to the history of oyster production in Alabama, Chris Nelson, vice president of Bon Secour Fisheries, thinks people sometimes have short memories. 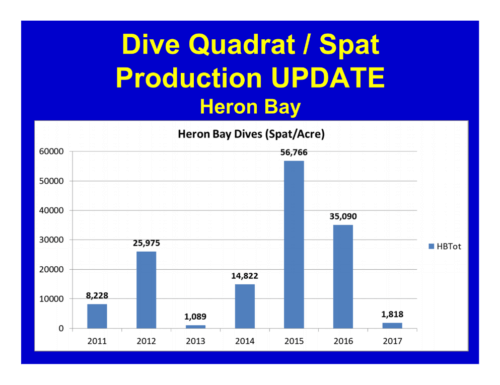 While he’s publicly stated that addressing things like “salinity change” should be a major focus, Nelson, who holds a master’s degree in marine science, also believes the decline in oyster production has roots that date back much further than 2008. Nelson’s family has worked in Bon Secour Bay for four generations, and during that time, he said, humans have changed a lot about the water system the feeds into it. He noted that rivers have been dammed upstream and the Mobile Shipping Channel has continued to expand. Nelson didn’t name any “channelization efforts” directly, but others have. Since the declines in recent years, some have suggested maintenance dredging in the shipping channel performed by the U.S. Army Corps of Engineers might be impacting oysters by redistributing sediment. Whether it’s from human activity or storm events, large disturbances of the sediment at the bottom of the bay can suffocate oyster beds in silt as sediment redistributes. The Corps hasn’t been the only source of dredging in the bay, though. Over the past two years, Herrmann said, “there’s been major concern” that siltation might occur from shipping channel maintenance as well as the state’s Marsh Island Project in Portersville Bay. In 2016, Portersville Bay Oyster Co. filed a lawsuit against ADCNR over the $11 million restoration project, claiming sediment from its associated dredging was creeping back into Fowl River, where the company had lost nearly all of its bottom-grown oysters to siltation. 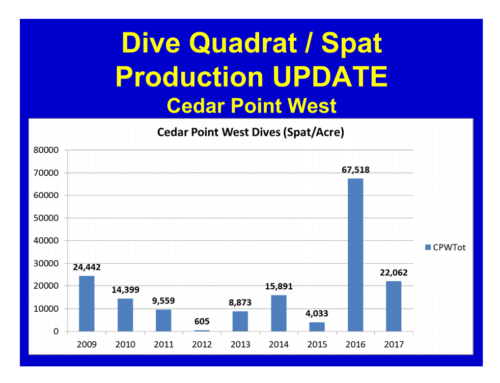 Herrmann said there was enough concern that ADCNR performed additional reconnaissance dives in October to see if there was a significant overburden of silt on any of the public reefs. There was, but only in the areas near those dredging projects. 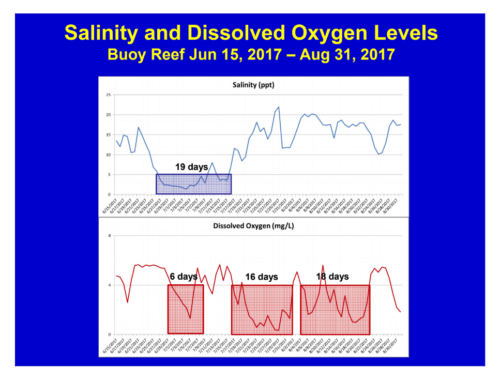 It’s worth noting the reefs that showed signs of siltation faced the same low levels of salinity and dissolved oxygen as other reefs that didn’t. According to Nelson, the situation in Alabama is interesting but not unique. He thinks it’s comparable to what Florida has seen in Apalachicola Bay. When the estimated oyster population there fell from 180,000 per acre in 2007 to fewer than 20,000 in 2012, it ignited the “water wars” — a lawsuit between Alabama, Florida and Georgia over the diversion of water from the Chattahoochee River to urban Atlanta. According to Florida, the reduced flow into Apalachicola Bay caused a lack of freshwater that increased salinity and caused massive declines in the oyster population. While the problems are different on Alabama’s reefs, Nelson said Apalachicola and Mobile bays share “the long-running theme” of humans impacting an oyster population. Since 2014, Alabama has used almost $7 million from federal grants on BP oil spill recovery projects that have primarily focused on planting cultch material and oyster reef restoration. Cultch typically consists of fossilized shells, coral or other materials oyster larvae can attach to and grow. 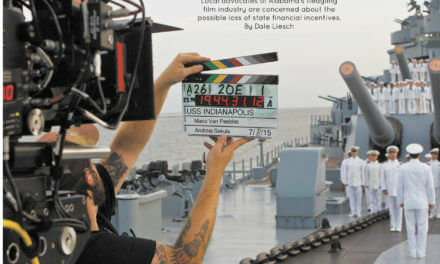 Once attached, it’s referred to as spat, and if producing spat was the goal those projects were a massive success. 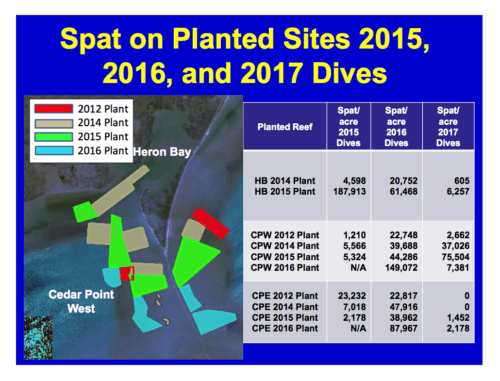 In 2016, ADCNR reported between 35,000 to 67,000 spat per acre on various public reefs — a significant increase from 2013, when some of the same areas had counts as low as 605. 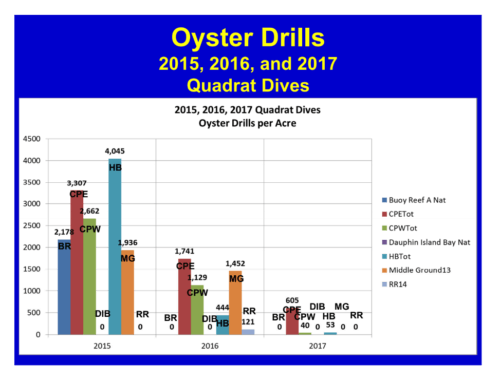 Despite those gains, oyster production still dropped from 2016 to 2017. Conservation Commissioner Chris Blankenship, who heads the ADCNR, said the type of cultch planting Alabama has undertaken with early funding from the BP settlement has been the go-to approach for oyster reef restoration for the last century. 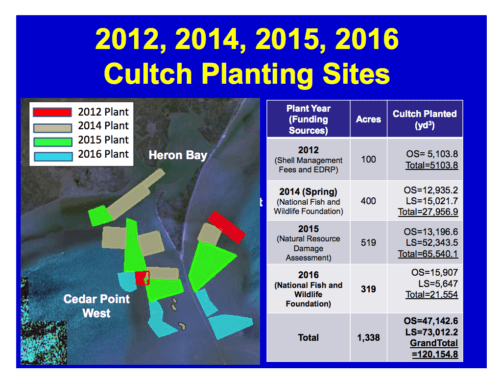 Other Gulf states are using their oil spill monies to plant cultch as well. Louisiana and Mississippi have also seen declines in oyster production, and both have paid for similar planting efforts in recent years to the tune of $14.8 million and $11 million, respectively. Blankenship said the state has tried other approaches, such as the 800-acre reef ADCNR created south of Fowl River in 2010 and 2011. However, he said, that project was ultimately unsuccessful. In all, at least $162 million will be spent on oyster restoration across the Gulf in the next decade and a half, earmarked from the Natural Resource Damage Assessment — one of four possible funding sources tied to the BP settlement. Though he didn’t get into many specifics, Blankenship said ADCNR is open to trying different approaches outside of cultch planting and also hopes to use oil spill funding to evaluate and study “how the salinity and other things in the estuary have changed” over time. 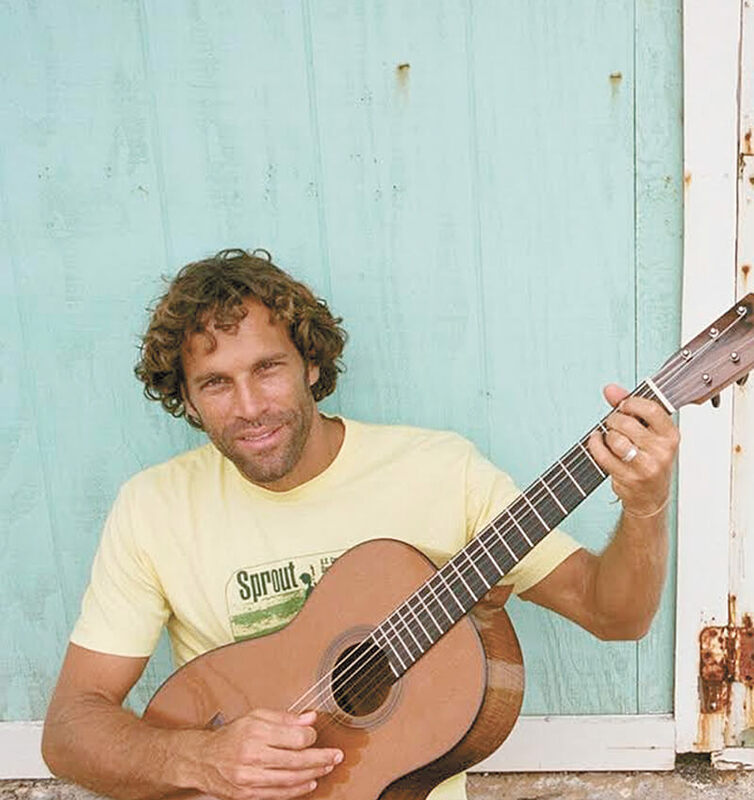 He also said Alabama isn’t alone in its quest to find a better means of oyster restoration. Florida and Texas have already undertaken specific projects evaluating their best restoration options moving forward — something Blankenship said Alabama may try in the future. While the concerted efforts from other states may ultimately help find a solution, the gulfwide issues are likely not good for oyster prices in the short term. According to Nelson, the Gulf oyster industry can be very interdependent; when one state has a good production year, it often ends up providing oysters in states that don’t. That’s why a number of oysters sold in Alabama in recent years have come from Louisiana and Texas. For a restaurant such as Wintzell’s, which sits just minutes from the waterfront, selling “Alabama oysters” would be beneficial from a marketing standpoint but would also support an industry that is vital to the state’s economy and a number of local jobs.